Few martial arts academies are as prevalent in the Northeast as TSMMA, and with close to 50 schools in New York, New Jersey, Pennsylvania and Connecticut (and also Florida), and legions of students that number in the thousands, the organization has long been the envy of struggling school owners who've gone bankrupt trying to build up enough of a client base just to pay rent. 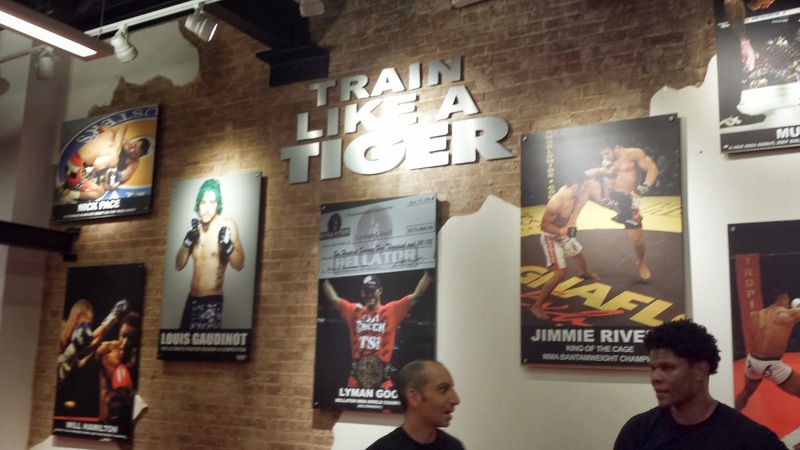 "Back in the day there was no mixed martial arts, there was just karate," says Ron Schulmann, who, along with his brother, Danny "Tiger" Schulmann, helped create the massive 30-year-old organization that exists today. Ron has invited me to check out their new location at 34 East 23rd Street in Manhattan - which will be one of two that's replacing the 19th Street location that served as TSMMA's flagship school for many years. We're in a somewhat quiet office, and outside, students are sitting on couches in a lounge area, hitting pads in a warm-up area, or upstairs in a bigger room, learning how to do an armlock from Bellator veteran Jimmie Rivera. I've asked Ron about the origins of the TSMMA system. "Back then we also wrestled - me and my brother both wrestled. We also boxed. But our main thing was the karate and that's all there was back then. We were in a hard style of karate - Kyokushin Karate, which is known to be a hard style. There was a lot of kumite, which is fighting. We knew how important it was to do the real thing. So when mixed martial arts came into this country, that was what - '93? And we saw the jiu-jitsu and all of that and were like "Wow!" We had a wrestling background, so we loved it. We gravitated towards it we liked it so much. But in order to get into it and to learn it and start teaching it in our schools, we couldn't keep doing what we were doing. We had to cut something out... We found something that was really effective. We saw how effective jiu-jitsu was in combination with striking. So we started training in that, we incorporated that into our schools, and we slowly pulled out forms and katas, we pulled out the weapons. 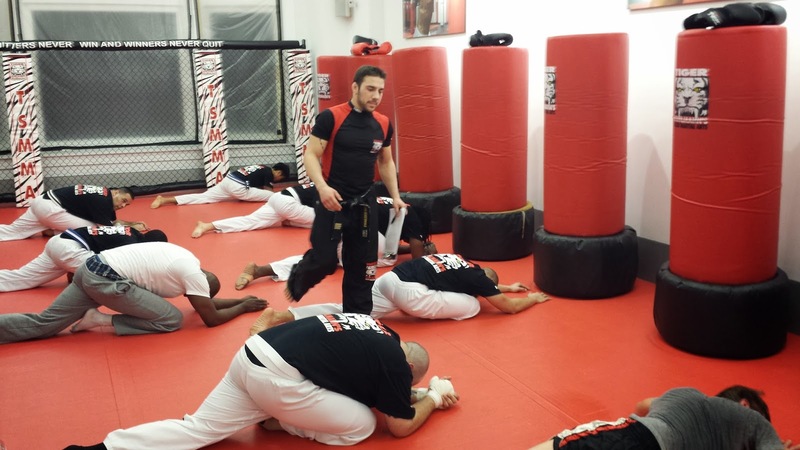 Some people got a little upset, but the people that didn't get upset were our instructors because they were passionate about martial arts and self-defense and they loved it also." I've been watching the Tiger Schulmann system of fighting in action for years. At Reality Fighting 2 back in 2002, one of their guys TKO'd a stud wrestler to win a championship belt. Homegrown fighter Lyman Good breezed through a tournament to become Bellator's inaugural welterweight champ. When he entered into the TUF House, Uriah Hall was a product of TSMMA, and the green-haired Louis Gaudinot is one of the UFC's most exciting flyweights. 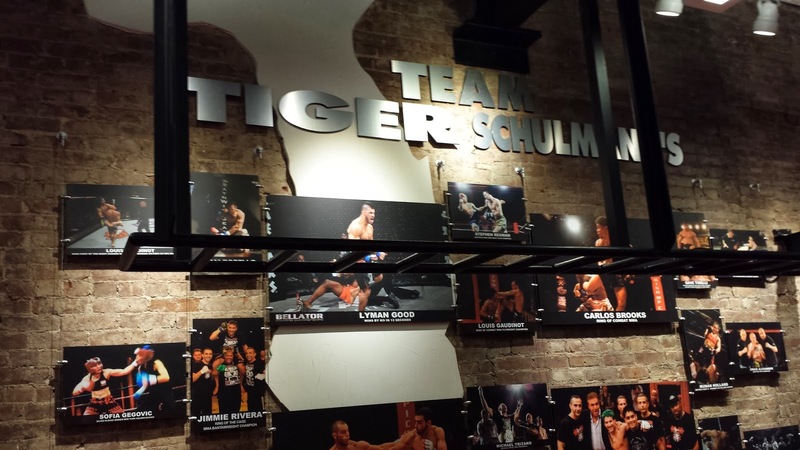 The fighters who have come out of the Tiger Schulmann camp have owned a sizable chunk of the regional MMA championship real estate for years. They've even been a force in the kickboxing scene and the Golden Gloves, too. And of course, they've flooded Grapplers Quests and NAGAs and come away with enough medals to build a tank. On Saturday night I watched from cageside as six newer members of the TSMMA hit squad battled it out at an MMA show in Queens. I ask Ron what it feels like to have helped create a team that's fielded so many skilled fighters. "It's great. It's really great for the individual fighters that we have, more importantly them for us. We just make sure they're trained well enough where it's safe for them. We don't want to throw them in unless they're ready. We have a really big fight team, so it's not like we're trying to find fights. There's not enough venues out there for all the fighters that we have. We have probably on some days training at our fight class at our headquarters [in New Jersey], we'll have 70 guys. Some days less - 20, 30 - but it's still a pretty big fight team. How does that make me feel? Of course I'm very proud, proud of the students who come up and fight. They usually do well." The subject of what TSMMA offers it's fighters beyond just instruction comes up, and Ron talks of what lies ahead for someone who's repped the organization in the cage. 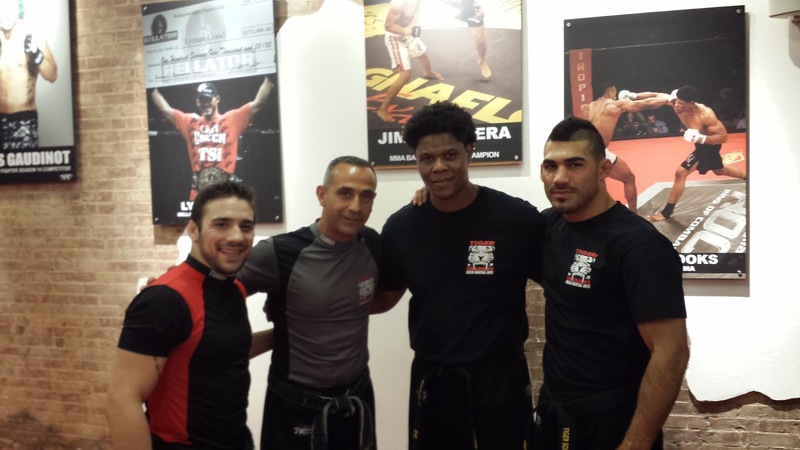 "One good thing about training at Tiger Schulmann's and fighting for our team is there's something afterwards. A lot of fighters, when they're done, they don't know what to do. Here, there is a path. So you, you're brought up through the ranks, you fight, and when you're done fighting - or, if you decide you never want to fight but you're that good - then you can become an instructor, open a school, and pass your knowledge on to other people." We talk of TSMMA's open-door policy, and how their guys often train with fighters from other camps. When I ask about his next top prospects, Ron mentions newly-crowned Ring of Combat champ Julio Arce and Cage Fury Fighting Championship's Shane Burgos. And then we're done. Good, Rivera and Carlos Brooks - three of TSMMA's best fighters/instructors - are waiting to be interviewed next, but their stories are for another time. Right now it's about Ron, and the powerhouse of martial arts training he had a hand in making. 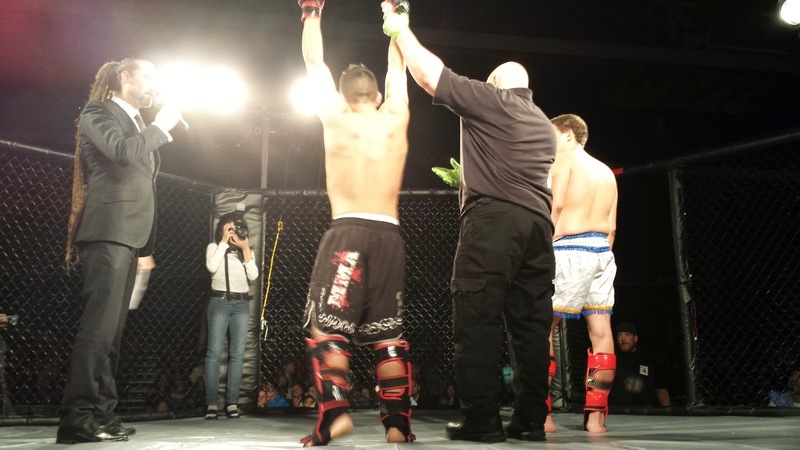 In a sport where every bout must have a loser, finding a gym that has tasted only victory in the cage is impossible. 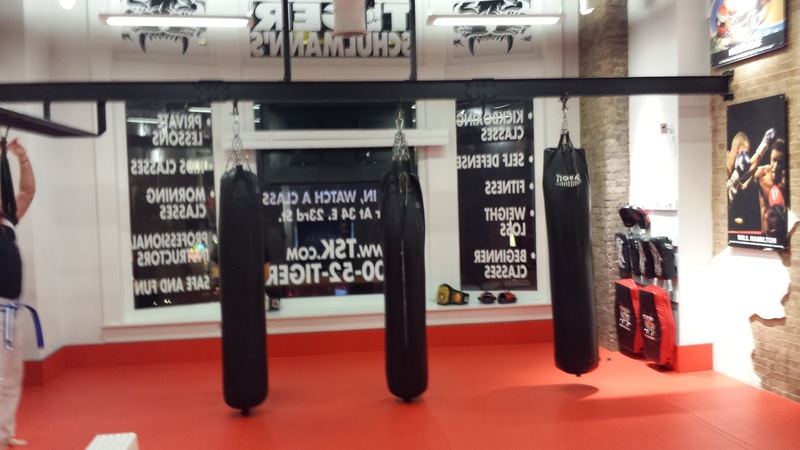 But finding one that wins more often than not, and offers more to its members than just the knowledge of how to throw a proper kick and punch, well, that's something that's possible, and even easy if you're in the the Northeast. Awesome article. Was Zach Maslany at Wildwood in 2002 and we haven't slowed down since. Thanks Jim! Any woman thinking of signing up at the Gramercy school, or any mother thinking of sending her children there, should make sure you sign up with Sensei Rivera and NOT Sensei Carlos Brooks. Brooks uses the job as cover to sleep with his students. When I was there, three of us thought we were in "exclusive", committed relationships with him. This went on for three years before we found out about each other, in part because he told each of us he would get fired if people knew (it's against the rules to date students) and in part because he used overnight "training at headquarters" as an excuse to wake up in one woman's bed and go home to different woman. He lied until the end. His lack of character and integrity is an embarrassment to the organization. He shouldn't be teaching there or anywhere. I have been training with Sensei Brooks for almost a year and it's been a fantastic experience so far. I enrolled more because of curiosity than anything else but after a week I was "hooked". Thanks to Sensei Brooks' dedication, enthusiasm and charisma, I happily wake up at 5.30 am to take the 6 am class at least 4 times a week. I really feel that his attention to details helped me to improve quickly and made me feel more confident. I also like that he is always there to help or to give good advices even after class hours. I also have a 5 and a half years old kid who wanted to do kick boxing. His first tryout was not convincing and he did not know if he really wanted to do it or not. I shared this with Sensei Brooks who organized a one-to-one private (free) with my boy. The class was awesome, Sensei Brooks really knows how to talk to children and to help them building confidence. My boy is now enrolled as well and loves it. I definitely recommend him. If you like to protect yourself, first of all you need to learn the basic item of boxing. So here Boxing in Connecticut will train you the basic item for the beginners.